On the Wind River Reservation, students are learning how to use futuristic tools to stretch the bounds of what's possible in the classroom. What if you could put a swimming pool in the middle of your classroom? “Me, me, me, me...” students gleefully shout. Although it isn't real, the excitement is audible as teachers use augmented reality to superimpose a swimming pool on the classroom floor. “Just wait, you're all going to be in it,” another teacher says. “ Whooaaa,” the students cry. The demonstration is being led Zenka, an augmented reality artist from Los Angeles. “My name is Jenny Carden, I use Zenka as my artist name and that's what most people call me,” Zenka says. Zenka is serving as a Futurist-in-Residence for Jackson Hole Wild, a non-profit organization that presents films, speakers and interactive events about science and nature. JH WILD brought Zenka to the Arapahoe schools where she's teaching students the difference between augmented and virtual reality. “Augmented reality is where you take a virtual object and you place it in the real world. Virtual reality is where block out your vision so we're not in this room anymore. We're inside a movie for example. So one can sort of transport you somewhere else and one mixes those two worlds together,” Zenka explains. That makes it possible, to bring, well just about anything you want into the classroom. Teaching science? How about a little virtual dinosaur to show and tell. Augmented reality can be tailored to the unique needs of a school. Here, for example, it could be used to teach the Arapaho language. “You know you can imagine them taking the idea of Pokémon GO, which is an augmented reality game, and putting that into their school, where they hide objects that then reveal the word in Arapaho once they find it. So this is a way to make learning engaging because humans learn by playing. And if you don't make education fun, it's hard for kids to grab onto the knowledge,” Zenka says. “Virtual reality and augmented reality is all new to me so going forward I see all kinds of applications we can use it with art and collaborating with other subjects in school, the culture, the language, science, social studies, writing,” Horsman says. “I think the kids really enjoyed it. It's part of their future and part of their present,” Horsman says. Horsman says the older students used augmented reality to create self-portraits. “Sixth grade took selfies. Eighth grade, I took the portraits and then they changed them to tell and reveal different aspects of their lives or personalities. I found that really interesting because as long as I've had some of these kids in class, I still found out some things about them I didn't know,” Horsman says. Zenka demonstrates. She opens a binder to a printed picture of a boy in front of a plain backdrop. Then she hovers her cellphone over the photo and an app reveals hidden images. “When you look at the overlay, he's got a circle showing clouds going into rain and then he's got a ton of books behind him. It's his bookshelf from home. He's telling us all the books that he's read,” she says. Zenka says she hopes students will continue to play with augmented reality once she's gone. “It's important when we have these new revolutionary concepts to explore them, to get our hands dirty, and to understand what can we do with this technology. Because what a 14-year-old Arapahoe girl does with it is going to be different than what I do with it in Los Angeles,” Zenka says. Embracing augmented reality, she says, gives students the power to design a future that reflects their own interests and ideas. 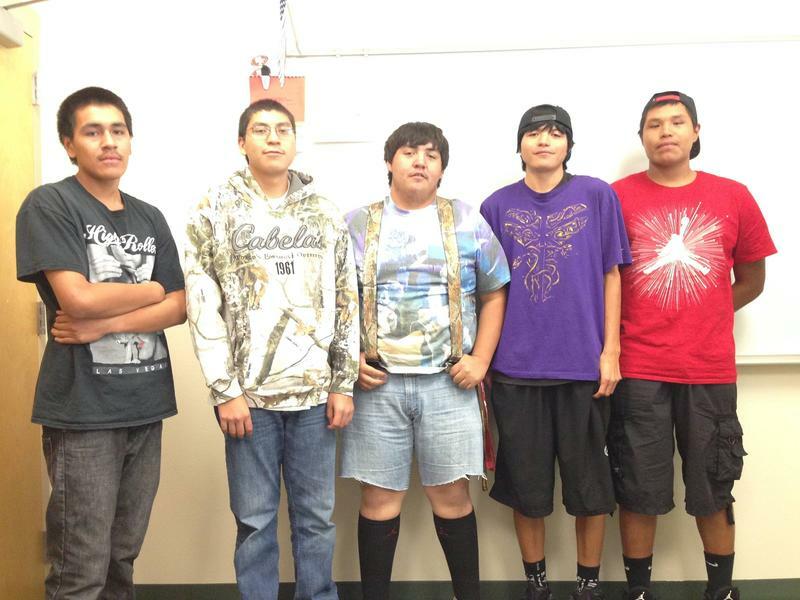 Fort Washakie High School is a small, struggling school on the Wind River Indian Reservation. The students there have been pushing towards one major goal: graduation. And, today, as part of our series on the school, we’ll hear some of those students cross the finish line. As family and friends file into the Fort Washakie gymnasium, the class of 2015 is outside posing for a final group photo. English teacher Mike Read offers a quick pep talk as he snaps his camera shutter. Fort Washakie High School on the Wind River Indian Reservation was a charter high school until a few years ago. Now it’s a public school. Most of its classes used to be online. Now, it’s building a brick-and-mortar building for 150 students. For now, around 50 kids and a dozen teachers make do in makeshift classrooms. The school’s last reported graduation rate was just 7 percent, but as it morphs into a more traditional high school, the current crop of students has high hopes for the future. This school year, we're following the academic progress of students at Fort Washakie High School—a struggling school on the Wind River Indian Reservation. Academic achievement—like most things at the high school—is on the rise. Thanks to its recent switch from charter to public, there’s a brand new school building in the works here. 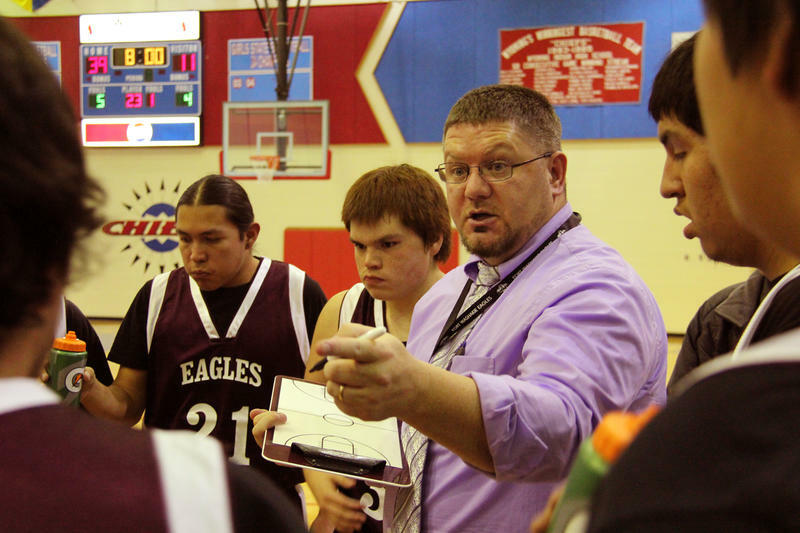 And students here have just taken a step that seems small, but is key to earning Fort Washakie its stripes as a traditional high school on the reservation. They've put together a basketball team.